Welcome to Western Maryland Hospital Center! We recognize that you may be visiting our site for any number of reasons and we sincerely hope we are able to offer you assistance. If you have a loved one in need of our specialty programs, we understand that this is a very stressful time. We can reassure you that you have come to the right place. If you are a discharge planner in need of a quality placement for your patient, you have come to the right place. If you are a competent and caring professional willing to guide your practice by our Code of Professional Conduct and you want to make a difference in the lives of your patients, you too have come to the right place. Western Maryland Hospital Center is not for everyone, not all patients or all employees. We specialize in rehabilitation and we want only the best in the business as employees. If you think we can be of service to you, please do not hesitate to contact us. We are here to serve the citizens of Maryland. 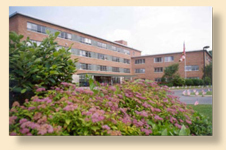 Western Maryland Hospital Center is a thriving specialized healthcare center delivering compassionate rehabilitation to clinically complex individuals in a therapeutic environment. We will be known for providing the highest quality care and rehabilitation through the collaborative engagement of compassionate people and community partnerships.